The other day Amy brought home a bag of Tootsie Pops. As many know, Tootsie Rolls are my favorite candy. However, as I dug into the bag, something odd was inside. 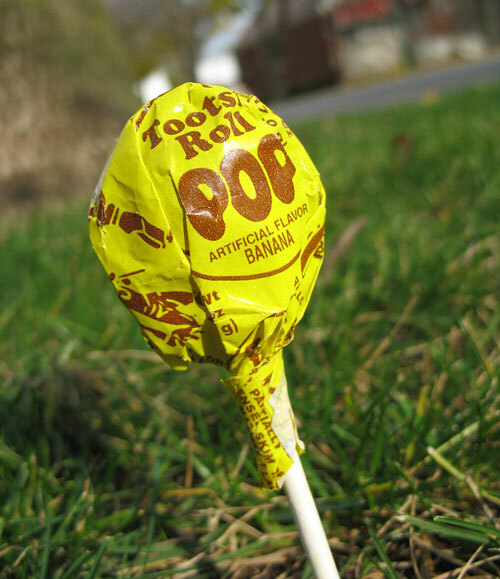 A Banana Tootsie Pop? Who thought this was a good idea? Sure enough, it was true. And after a taste, it was also gross. I was hoping that this wasn't a permanent change. Back in 2004, the company rolled out new flavors: Watermelon, Blue Raspberry, and Strawberry. In 2006, Lemon Lime was added, then Caramel in 2007. However, it seems like these were short-term additions, as they can no longer be found today. Per the official Tootsie website, "the original five-flavor mix — Chocolate, Cherry, Orange, Grape and Raspberry — has been expanded to include a new sixth flavor that alternates among Pomegranate, Banana, and now Blueberry flavored hard candy." I've had the Pomegranate. It's not bad. Haven't found Blueberry yet. But I can confirm that you should avoid any bags containing Banana. As I mentioned on Twitter, "Banana Tootsie Pops are the reason vomiting was invented."